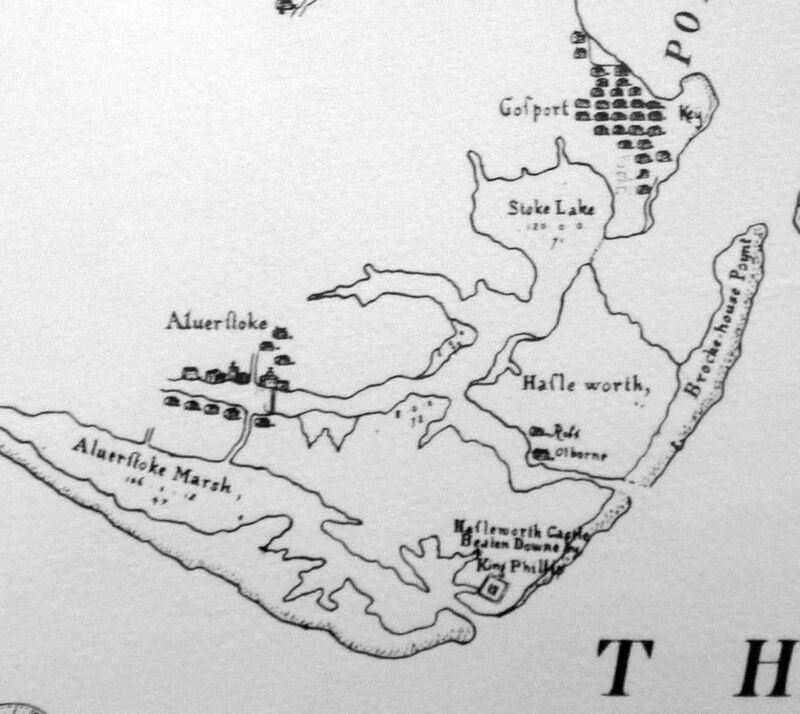 The area at Gilkicker Point is shown on a map by Burt of 1518 as ‘Alverstoke Marsh’ and again on a map dated 1716 as ‘Stoke Morass’, a large swamp fed by the River Alver (before it was so named) as it flowed along the Bay parallel to the sea, finally exiting though a wide open mouth into Stokes Bay. Over the years this seems to have slowly silted or dried up. 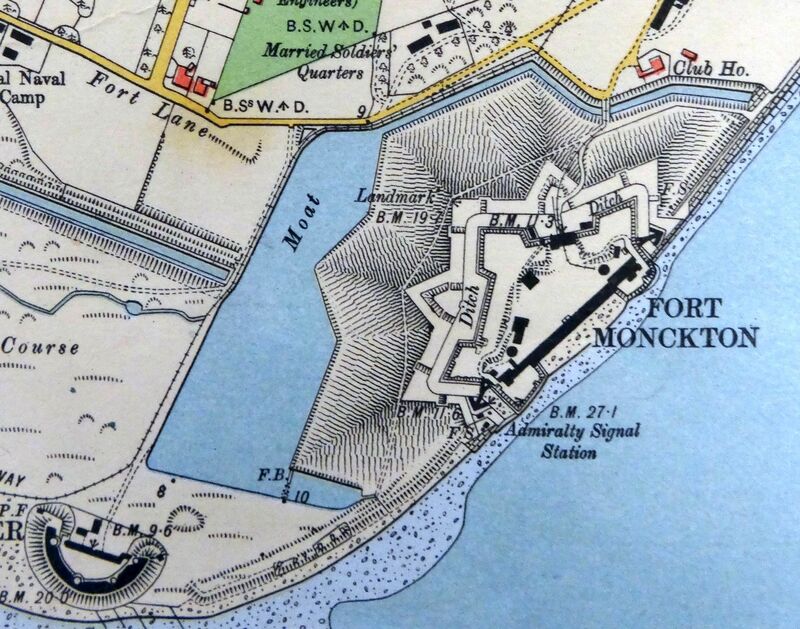 A map of land use drawn in 1784 shows the newly constructed Fort Monckton with a nearby pond or lake, still being fed by the river flowing through ‘Stokes Marsh’, but with no discernible opening to the sea. 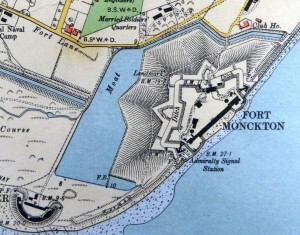 The reconstruction of Fort Monckton partially incorporated the lake at Gilkicker into the water defences of the fort. 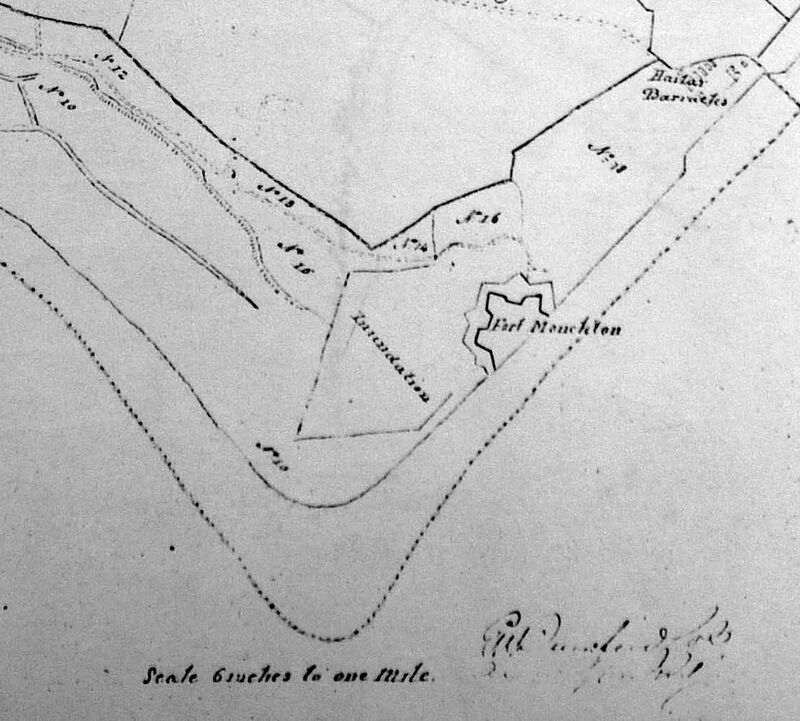 A plan of 1832 and again in 1858 shows the newly formed lake at Gilkicker as part of the moat surrounding the fort and the River Alver (now named as such) still flowing into it via a small pond on its western side. 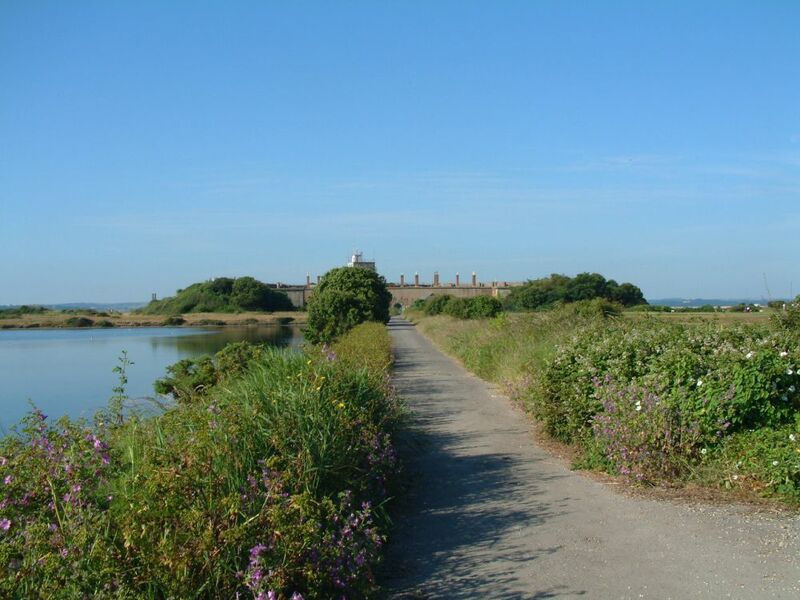 In 1860 the Royal Engineers diverted the River Alver into their newly constructed Stokes Bay Moat system so drying up the course of the river along the Stokes Bay shore line. 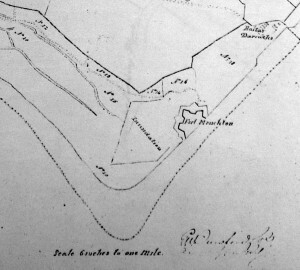 The end of the moat was fed into the Lake at Gilkicker through a culvert and from there it exited to the sea via a short ‘drain’ at the southeastern corner. 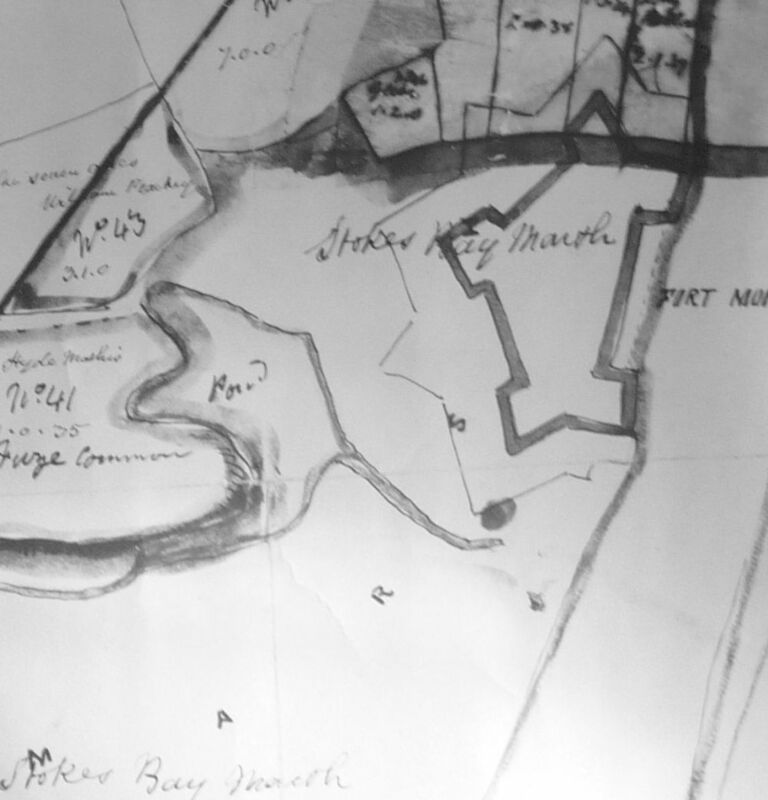 This continued to be the route for the Alver until the moat system was no longer maintained as an active defence by the Military and was finally filled in from the 1930 onwards, starting with the section around No. 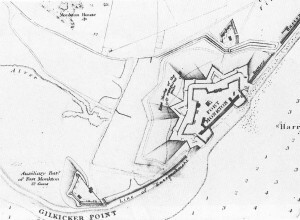 2 Battery where the River entered the moat system. 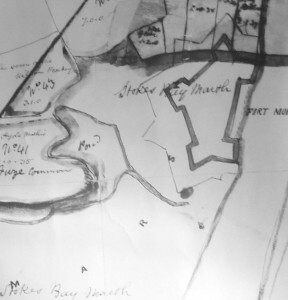 A sluice at the southwestern corner of No.2 Battery became the main exit to the sea. It still uses this route today. 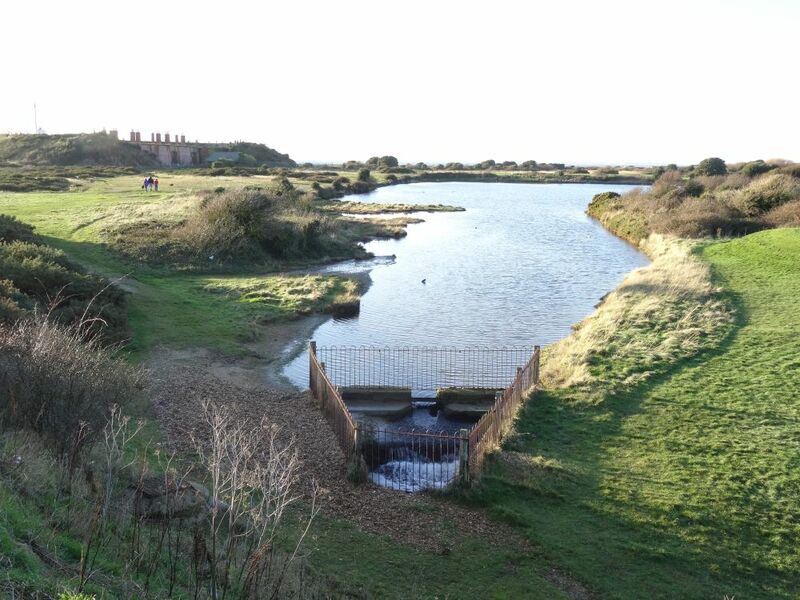 Gilkicker Lake continues to be fed with water by surface drainage and seepage across the land that is now occupied by Stokes Bay Golf Course. 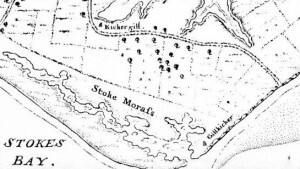 After the Stokes Bay Moat was constructed maps still showed a small stream running outside the moat at its eastern end indicating that springs continued to feed the area. 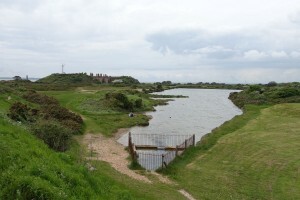 This area still floods and the Golf Club have dug a series of ditches connecting into the Lake. 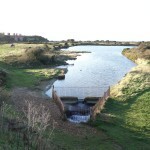 The sluice to the sea is still actively maintained giving Gilkicker Lake a saltiness in which unusual species can survive. Gilkicker Lake (Lagoon) covers 3.7ha and was designated in 1984 by English Nature as a Site of Special Scientific Interest because of its population of species that survive in the harsh salty environment of its water. It was rated as second best in the UK in terms of its conservation value. They state that five nationally rare types of mollusc live in the lake enjoying the salinity of the water that is replenished through the sluice connecting it with the sea. English nature’s citation explains: Gilkicker Lagoon represents a rare habitat in Britain, where there are relatively few saline lagoons. 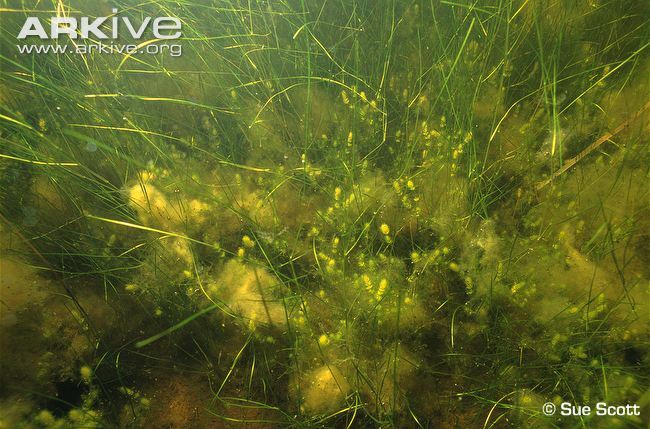 The flora of Gilkicker lagoon comprises three species of charophytes (one, Lamprothamium populosum, Foxtail Stonewort, being a national rarity), green alga Enteromorpha species, and tassel pondweed Ruppia maritima. The invertebrate fauna includes at least 10 species of molluscsm and 3 species of Coelenterata (anemones and allied groups). This assemblage is relatively rich and includes 5 national rarities, one of which the Colenterate Nematostella vectensis is the only British marine invertebrate to be included in the appropriate Red Data Book: IUCN 1983 which documents vulnerable and endangered species. Gilkicker Lagoon remains a high salinity system of two basins, supporting a diverse community including eight animal and two plant lagoonal specialist species; two of the former, Nematostella vectensis and Gammarus insensibilis are also scheduled. 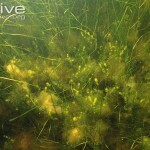 The northern basin had beds of Ruppia and floating mats of Chaetomorpha linum, supporting a diverse community. The southern basin, historically supporting a dense Ruppia bed as well as Zostera turf, was almost devoid of submerged plants in 2010. As a result, the benthic community was more sparse and less diverse. The reasons behind this loss of the ENLag.Veg biotope in this basin are unknown. Other than potential use of algicides, there appear to be no threats to the integrity of this site, which remains of high conservation value. 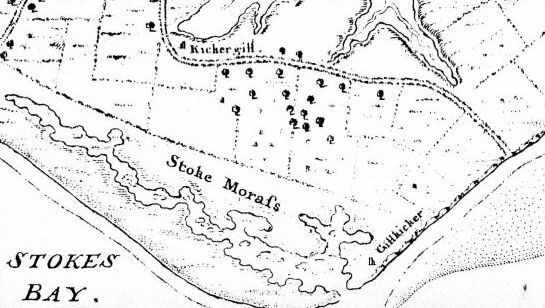 The decline at Gilkicker is a matter of some concern, and warrants further investigation. It is unfortunate that there is no policy in the UK to monitor these SAC sites on an annual basis, as it may prove impossible to find the cause for the change at Gilkicker owing to the intervening gap of seven years between successive surveys. 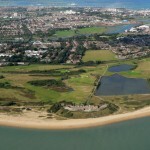 Gilkicker Lagoon is a Special Area of Conservation (SAC) designated under the European Union Habitats Directive. 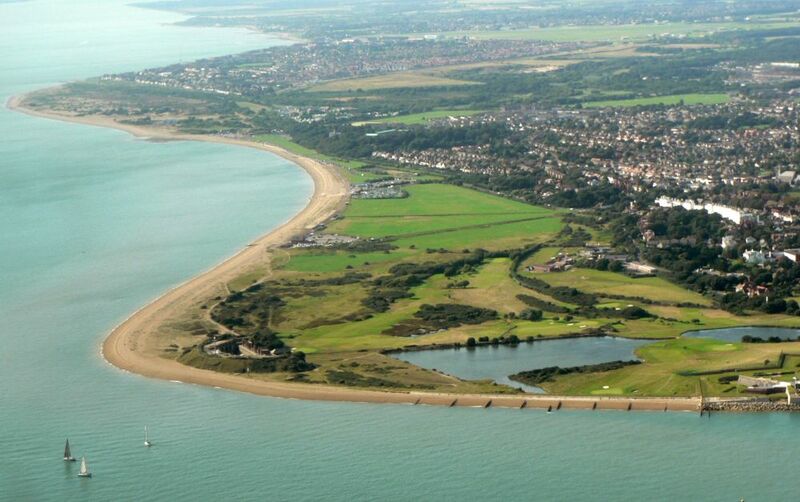 Gilkicker Lagoon (together with parts of Portsmouth Harbour) is identified as a Ramsar site. Ramsar sites are designated as wetlands of international importance under the 1971 Ramsar Convention. At Gilkicker the tide-line is populated by invertebrates and their predators. Dunlin, black-headed gulls and common tern feed in the area. Wildfowl including Brent Geese feed in the Gilkicker area. 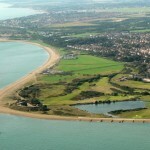 The Lake can be viewed by walking eastward from Stokes Bay beach towards Fort Gilkicker. 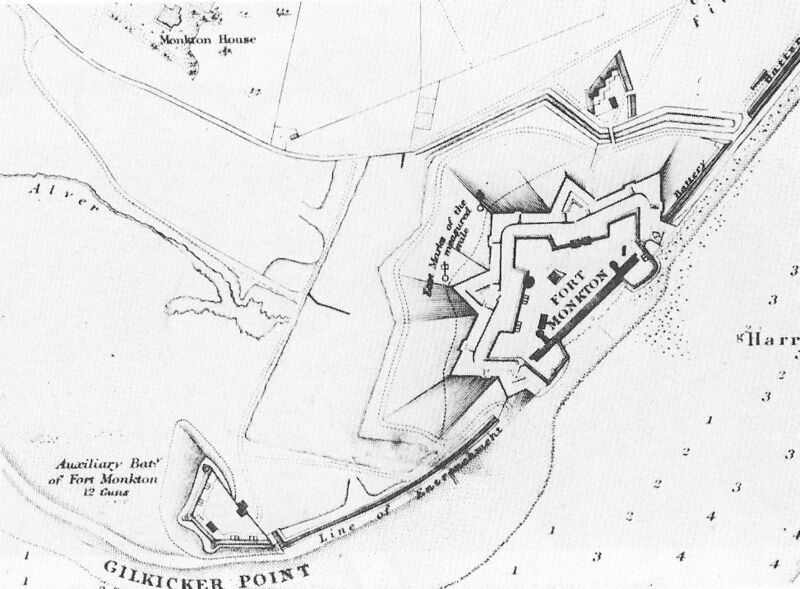 From the top of the earth mound covering Fort Gilkicker you can look northwards over the Lake. 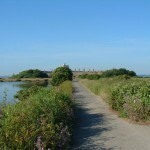 The road to Fort Gilkicker (now named as William Jervois Way after the Military Engineer responsible for the building of the fort) from Fort Road follows the western shore of the Lake. 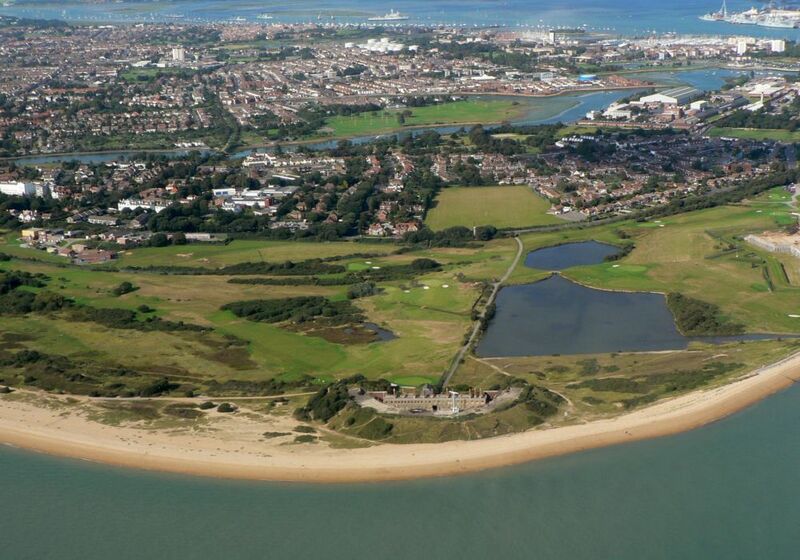 The mid point of the Lake has been filled in recent years to allow the golfers to cross it from one tee to another.